Celebrating its 10th anniversary, the annual can’t-miss congregation of heavy, hair and glam metal bands that is the M3 Rock Festival returns to Columbia, Md.’s Merriweather Post Pavilion Friday, May 4th and Saturday, May 5th. Returning for the second year, M3 Southern Rock Classic will hit the stage Sunday, May 6th. Multi-day tickets go on sale Friday, Feb. 2nd at 10am EST through ticketfly.com. Turning back the clock to the 1980s with dedicated fans from six continents, 15 countries and 40 states, M3 is known for its idolized metal bands and vibrant, devout audience. The first two days will once again feature full sets of heavy metal hits and glam rock, taking place on two separate stages – Merriweather’s main pavilion stage and the Chrysalis stage in the woods — each simulcasting the other, giving fans the option to stay in one seat and watch all the bands as they appear on both stages, or move from stage to stage without missing a note. The music continues one more day with the return of the M3 Southern Rock Classic. I.M.P. Presents M3 Rock Festival starts with The Official M3 Kix-Off Party on Friday, May 3rd at 4:30pm, featuring Kix (the local legends with a perfect attendance record – having played every single M3), Cinderella’s Tom Kiefer, Y&T, Faster Pussycat and Nelson. 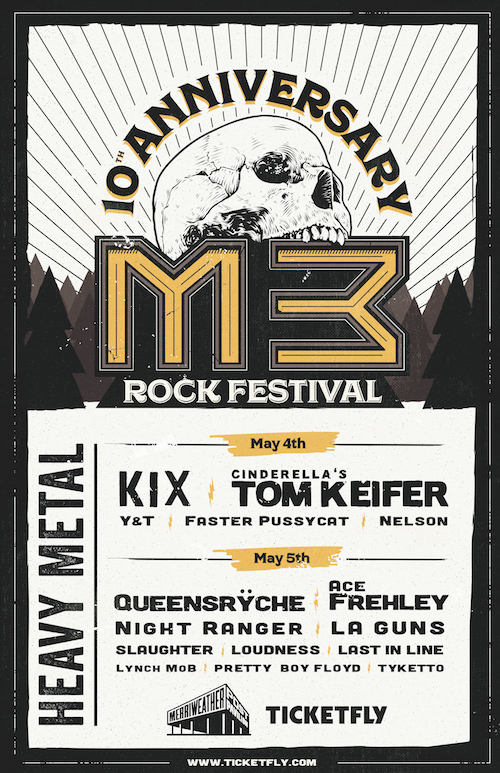 The full-blown 2018 M3 Rock Festival begins Saturday, May 5th at 10:30am and includes Queensrÿche, Ace Frehley, Night Ranger, Slaughter, LA Guns, Lynch Mob, Loudness, Last In Line, Pretty Boy Floyd and Tyketto. Sunday’s Southern Rock Classic returns this year with The Marshall Tucker Band (who made their Meriweather debut in 1979), Blackberry Smoke, The Outlaws, Pure Prairie League, The Georgia Satellites, Atlanta Rhythm Section, Hannah Wicklund & The Steppin Stones and 1 Nite Stand. Each year VIP and Pavilion seats sell out quickly. Two-day, three-day and VIP packages go on sale Friday, Feb. 2nd at 10am EST through ticketfly.com. Tickets can also be purchased at the Merriweather Post Pavilion, 9:30 Club, The Anthem and Lincoln Theatre during normal box office hours. If available, single-day tickets will go on sale in the coming weeks. For more information, visit ticketfly.com or M3rockfest.com. Cool lineup. especially Day 2.